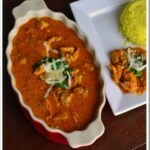 If I had to pick one dish that I make really well, that would be Chicken Tikka Masala! This was attempt #2 and I totally LOVED it. This reminded me of all the good times I had eating in Mumbai restaurants – served with a little cheese on top..YUM YUM..100 times over..Of all the restaurants I have been to in US, I have never tasted a Chicken Tikka Masala entrée which would come half as close in taste to the ones found in good old Mumbai.. The best part of this recipe is – It is easy to make and does not need 100 ingredients! Just my kind of recipe!! 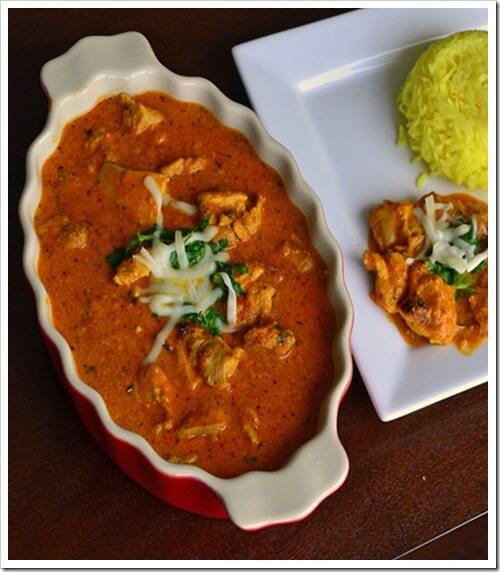 I based this Chicken Tikka Masala recipe from the one I found in the Food Network website. In my first attempt, I followed the recipe closely (sans the tomato paste) and the resultant curry was a little on the spicier side for me and my guests. Therefore in my second attempt, I decided to do it my way – I knew the ingredients to use and decided to find my own balance of what quantity is needed and ended up with this recipe. 2 teaspoons sugar, my secret ingredient! Whisk together all the marinade ingredient to create a smooth paste. Toss the chicken pieces and rub the marinade in the chicken to make sure it is well coated. (Though it is advisable to leave the marinated chicken refrigerated overnight to get the flavor in, I usually don't and it turns out okay). Meanwhile, place the marinated chicken in a broiler pan,broil on High for 5 - 10 minutes (Timing depends on your oven). Watch it carefully, remove from oven when the chicken begins to char. Add the gravy back to your wok on medium heat.Add 1/2 cup water and bring the mixture to boil. Add the chicken, salt, chilli powder, garam masala and sugar and let it cook on medium heat for another 10 minutes or so till the chicken is done. Reduce heat down to a simmer and add the cream and fenugreek leaves and mix them in. Let it simmer for another 5 minutes. Take it off heat. Add coriander leaves and mozzarella cheese and serve hot with Rotis, Naan or Rice.